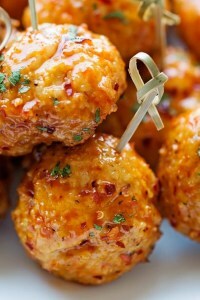 Chicken meatballs, spiced up with a sweet, savory, and spicy firecracker sauce. They’re tender, filled with flavor, and require minimum work! If you’re not a fan of chicken meatballs, you can swap it out for turkey or any other kind of ground meat you please. Panko is a Japanese style of breadcrumbs. A combination of ground chicken and turkey can be used to make these meatballs. If you would like to serve your meatballs with sauce, I would double the ingredients for the sauce portion as this recipe makes just enough for basting. The meatball mixture can be prepared the night before and baked the day of, if desired.